Cookie Monster is one of the most famous characters in Sesame Street. He is known for his huge appetite for anything edible (and sometimes inedible as well), but especially for cookies. His signature song ‘C is for Cookie’ became one of the most famous songs from Sesame Street. Cookie Monster is a blue, furry monster with googly, round eyes and can be seen with a cookie on hand more often than not. 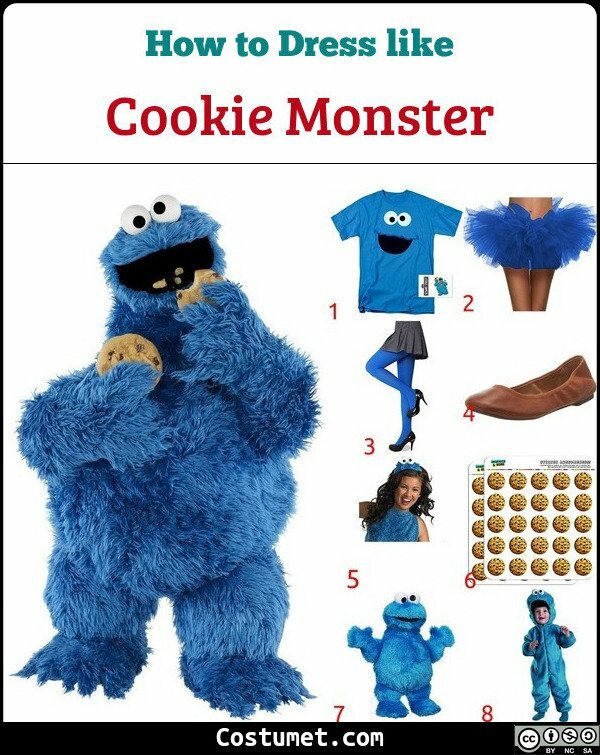 Here is everything you need to look like Cookie Monster. 1 Cookie Monster Shirt Use this Cookie Monster Face shirt as the base of your costume. 2 Blue Tutu A blue tutu adds a nice feminine touch to your Cookie Monster costume. 3 Blue Tights Wear blue tights to make it seem like you’re color blue. 4 Brown Flats Make use of brown flats as if you have cookie shoes. 5 Headband Wear this googly eye hairband to make it seem like you have Cookie Monster’s eyes. 6 Stickers Place cookie stickers all over your tutu. 7 Plushie Bring along a Cookie Monster plushie so you could have a friend with you. 8 Kids Costume Set Transform your kid into a cookie-loving monster with this costume set. 9 Costume Set A quick and easy costume is possible with this costume set. He was first voices by Frank Oz but is now performed by David Rudman. Mr. McGibblets has mostly purple fur with a few neon green parts. He has two large eyes as well. Tony Soprano’s style is casual but commanding. He usually wears a loose-fitting top, a pair of classic-cut dress pants, and classy Oxfords.